Ash Servant is a rare Intelligence creature card. It is part of the Core Set. In addition to the card's availability in the Core Set, two copies are included in the Dagoth's Might theme deck, and one copy in the Warriors of Hammerfell deck. An alternate-artwork version of the card is available in the Starter Pack. The card's alternate art was created by Nuare Studio. 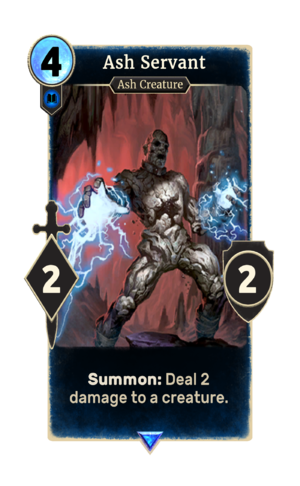 The card's art appears to depict an Ash Spawn, which first appeared in Skyrim's Dragonborn add-on. This page was last modified on 28 October 2018, at 06:10.